Many working environments involve potentially hazardous fumes such as dust laden or oil contaminated air which can be dangerous to health, process or operations. It is therefore extremely important that companies meet legislation and consider the safety of their workers. 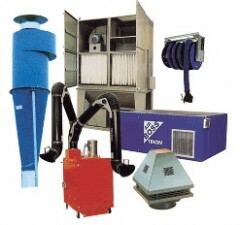 Alan Williams & Co provide a wide range of air treatment solutions, tailored to match the needs of numerous applications where dust, fume and odour are involved. Our engineering team are skilled in the selection and application of the myriad of systems available from the world’s leading manufacturers.